When it comes to building guitars, I like to take a practical approach, always refining the designs and keeping them functional. They are road-worthy, but not over-built. I’ve learned through experimentation how to make an archtop guitar sound fully acoustic, without the familiar ‘bark’ as found on poorly voiced instruments. At the same time, I understand that most performers use magnetic pickups which can sound muddy when over-loaded with acoustic information. So more often my instruments are voiced to sound good when amplified. When it comes to repairs and setting up instruments, I work with specific measurements and reference points. If an instrument is transformed after a repair, it is not because of a magical touch, just attention to detail and careful decision making. Guitarist and guitar-builder John Moriarty is a graduate of the National College Of Art And Design in Dublin where he studied Visual Communications. 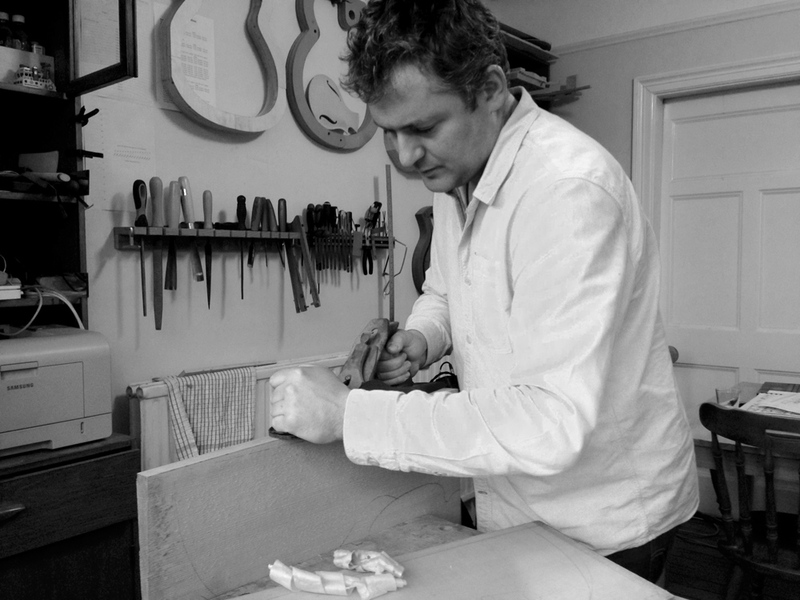 John’s guitar building is a culmination of his two interests – visual design and music. He has played countless concerts including Guinness Jazz Festival, Glasgow Jazz Festival, Euro-Jazz Festival in Mexico City, JJ Smyth’s and Vicar Street. John has recorded and toured with U.S. pianist Bill Carrothers and performed with Bobby Watson of ‘Art Blakey’s Jazz Messengers’. He has also played many guitar duets with fellow Irishman Louis Stewart. John’s guitars were featured at the Healdsburg International Guitar Festival 2009 in California and more recently at the launch of the Holy Grail Guitar show in Berlin.